Do you balk at the thought of eating red fermented bean curd? It looks like it's been left to rot in rusted liquid for a very long time! This fermented tofu that has been soaked in brine with rice wine and red yeast rice. The result is a pungent, winey red bean curd. It has the texture of a thick bread spread. Sight and smell combined, I count this as intimidating stuff. It's not very appetising to look at, but it does add 'exciting' to fried chicken. I keep a jar of it around to add into BBQ rubs and marinades too. 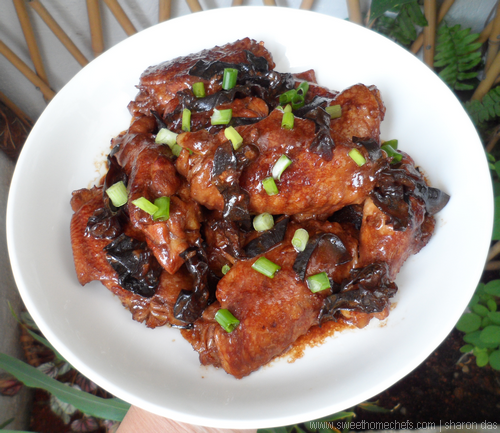 I love using red bean curd as a flavouring agent in meat dishes in lieu of salt. I knew it would work great in a braised chicken dish since I've tasted it in pork dishes before. Here's what I made the other day that had us licking our fingers and going for seconds. The chicken wings turned out flavourful; a rich well-rounded taste. Try it, but be cautious with the portion of bean curd that is going into the dish because it's salty stuff! 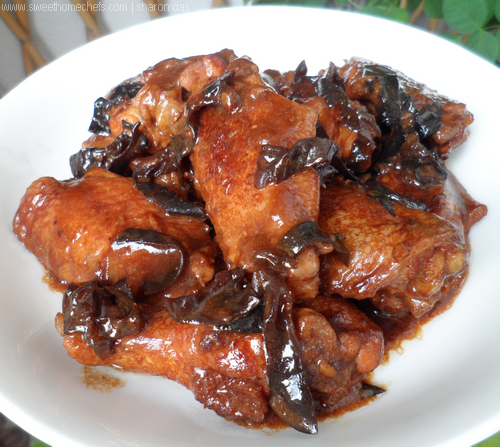 1) In a bowl, mix chicken (drumettes and wings) pieces with corn flour, rice wine and dark soy. Leave aside. Prepare the rest of the ingredients. 2) Then, add ½ piece red bean curd into the bowl of chicken. Mix well. Heat oil in pan and pan-fry the chicken pieces for about a minute. (Do not pour in the seasoning liquid from the bowl as yet.) Push the chicken aside. 3) Add pounded garlic and dried cloves into the empty corner. Saute for a bit. 4) Then, stir all the ingredients together. Add black fungus, jaggery and the remainder of the red bean curd. Stir to combine. 5) Add water into the bowl that contains the seasoning liquid. Pour this into the pan. Lower the heat and cook covered until chicken is done or for about 20 minutes until the flavour comes together. Then, cook uncovered on high heat to reduce the liquid into a thick sauce / a nice glaze. 1) Red bean curd, garlic, black fungus, dried cloves, chicken! 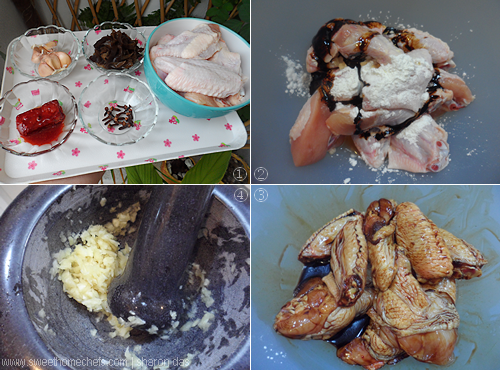 2) Mix chicken with corn flour and dark soy. 5) Behold! Red fermented bean curd. 6) Pan-fry the chicken pieces. 8) Finally, throw everything in together. Simmer and voila! Red Fermented Bean Curd Chicken fresh out of the pan! Best eaten with rice or congee! 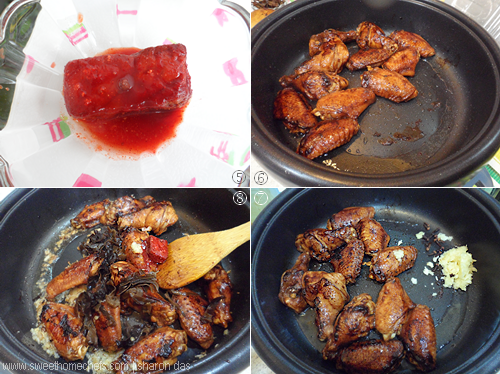 I never like red fermented bean till many years ago whrn I tasted my bil's nam yue chicken wings. Since then I fall in love with the pungent bean curd. Wahaha. Sinful but delightful food. I will try your recipe out. Usually I deep-fried the chicken. But your method looks good. I like the look of the stickiness glaze on the chicken. I have had the fermented bean curd with congee, but never the red one...yes, it takes some acquire taste, I know I will like this chicken dish. I don't eat the beancurd on its own but I like it when it's used in other dishes - my relative makes deep-fried nam yue pork belly - it's so freaking good! My friend gave me a bottle of this nam yue recently, I'll definitely have to give your recipe a try! Oh..I can imagine how yummy the pork belly must taste, Jasline! I'm salivating. This is a new one for me! I'll bet it is very rich and good! I still have a bottle in the fridge :-)) This looks fingerlickingly delicious, Sharon.